Lester Piggott was described this week by fellow record-breaking jockey AP McCoy as the "greatest sportsman of all-time". The Gauteng SANSUI Summer Cup is the power, the pace and the pulse of an esteemed legacy of thoroughbred horse racing in Johannesburg. 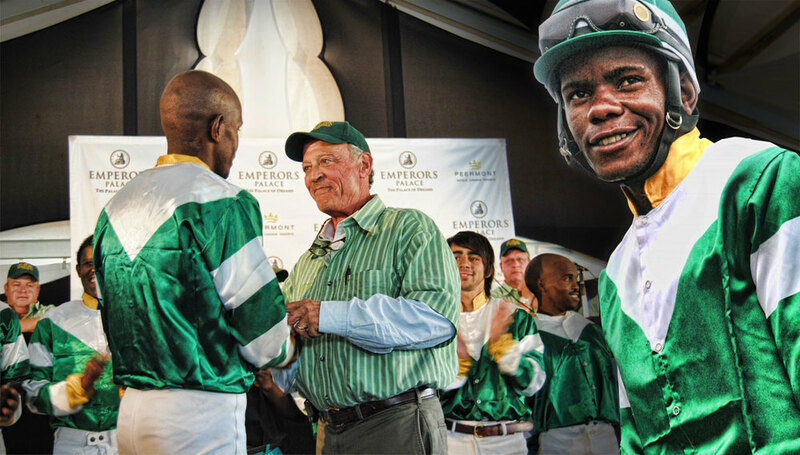 One of South Africa’s greatest jockeys and sporting ambassadors has decided to call it a day. 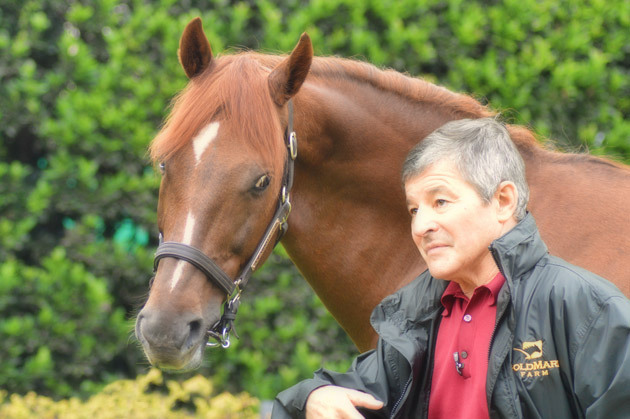 Felix Coetzee rode 3508 winners in a glittering career where he was crowned South African Champion three times and won 75 Group 1 races internationally. The champion jockey, who has ridden 3508 winners in South Africa, Hong Kong, Singapore, England, Macau, Dubai and Mauritius, including an extraordinary three Durban Julys, eight Gold Cups, five J&B Mets and two Summer Cups, will be a major loss to the local riding ranks. He rode mainly for the powerful Justin Snaith yard in the last few seasons. Coetzee has been associated with three of the greatest horses of recent years in Empress Club, Silent Witness and Rocket Man. He was stable rider to the maestro trainer Terrance Millard, which provided him with a legendary host of big race winners throughout the 1980s and early 1990s, as well as three Jockeys Championships. He relocated to Hong Kong in 1992 and eventually teamed up with former champion jockey Tony Cruz. Coetzee helped Cruz win his first Trainer’s Championship in the 1999/2000, a title he also won in 2004/2005. It was his partnership with the legendary Cruz-trained Silent Witness that made Coetzee a household name amongst the global racing community. The Australian-bred gelding won his first 17 starts and Felix partnered him in every one of his 29 career starts. Coetzee was always destined to reach the highest level in horseracing. 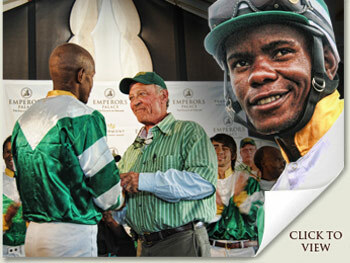 His grandfather was an owner-trainer and his father Hennie trained out of Summerveld. The records show that his first winner was in an amateur race at Richmond aboard a quarter horse called Middleberg, whom he regarded as one of the top three fastest horses he had ever ridden. His first professional winner was for his father aboard Royal Drummer and his first feature winner was as a sixteen-year-old aboard Kentford in the 1975 Clairwood Winter Handicap. He won South Africa’s premier staying race, the Grade 1 Gold Cup on In Writing in 2012, in one of the greatest tactical rides seen at the top level in recent times. Coetzee has been devoting his recovery time to his family. His wife Janine and two children, 23 year old daughter Katherine and 13 year old son Daniel have enjoyed having Dad at home. The South African horseracing industry will be waiting with bated breath to hear what move Felix Coetzee makes next. His vast experience and expertise will no doubt be highly sought. If there’s any virtue in hardship, it’s that it makes us appreciate the good times when they come around, and there are any number of stories among the champions of the business, political and sporting worlds of people who grew up tough. How many kids have emerged from poverty with a greater hunger than their coddled contemporaries, how many rags-to-riches stories are there of people who’ve been driven by the memories of their deprivation and their envy of those who had it all? Just as France’s “impregnable” Maginot Line was overrun by German invasionary forces in the spring of 1939, a toddler who was to inscribe his name into thoroughbred lore, was born to an impoverished French family in Agen. At the tender age of 5, Jean Cruguet was placed in an orphanage after his father abandoned the family, leaving his mother destitute. She had no choice, and from 10 to 16, the young Cruguet lived at a secondary school run by Catholic priests, where he faced all sorts of abuses, not the least because he was the smallest guy in the school. At 16, his size became his greatest asset, as an associate of his grandfather offered him work at a thoroughbred racetrack. A budding career in its embryo stages as a jockey was interrupted by mandatory military service in the French Foreign Legion in Algeria. Cruguet returned to thoroughbred racing after four years, and replaced the army-bound future champion, Yves St-Martin at the all-conquering stable of Francois Mathet, famed for his association with the Dupre horses which were to form the foundation in later years of the Aga Khan’s powerful breeding enterprise. A chance liaison led to his marriage to the supremely talented horsewoman, Denyse, a pioneering female in the French racing industry. Later in life, Jean acknowledged her abundant skills of horsemanship, when he said she was “the best horse I ever rode”. They soon decided to take their chances in the United States; it was the beginning of an explosion. Cruguet had hardly arrived when he was offered the plum position of stable jockey for the celebrated conditioner, Horatio Luro, famed for polishing the talents of one of America’s greatest racehorses and certainly the world’s greatest stallion of all time, Northern Dancer. In 1969 he gave notice of things to come when he replaced Roberto’s rider, Braulio Baeza on the future Hall Of Fame inductee, Arts And Letters, charging home in the time-honoured Metropolitan Handicap at Belmont Park. In 1971, he was connected with the horse he claimed was the best he’d thrown a leg over thus far, coaxing Hoist The Flag to an unbeaten two and three-year-old campaign. Hoist The Flag suffered a career-ending injury in his preparation for the Wood Memorial in the lead up to the Kentucky Derby; the decision to pack him off to stud at the Hancock’s Claiborne Farm denying the colt a shot at the Triple Crown. That was the beginning of a highly productive career at stud where his progeny included the dual Prix de l’Arc de Triomphe champion, Alleged. The cruelty of fate raised its head again, when Hoist The Flag broke a leg at a time when his stud life was just beginning to blossom. Little did Cruguet realise that there were even bigger fish to fry in the United States, as he and his wife decided to return to France for the 1972 season; this time he landed with his proverbial “bum-in-the-butter”, as he swept the major Group One races for fillies including the Prix Vermeille and the Poule d’Essai des Pouliches in France, as well as the Champion Stakes in England and wound up second in an abbreviated calendar in the French Jockey’s Championship. In the final session, he strapped his saddle over the back of the champion San San, whom he rode to all her wins, including the King George VI & Queen Elizabeth II Stakes for the storied Angel Penna Snr, bar one, and that was the only one that mattered to a Frenchman. He was prevented by injury from taking the ride in the Prix de l’Arc de Triomphe, and the filly duly obliged for the flamboyant Countess Bathiany. Cruguet paid us a surprise visit on Sunday, having been advised by any number of Kentucky horseman, that if he was to make the journey to South Africa, he was compelled to visit Summerhill. He tells us that his childhood reminds him constantly that life gives you one chance, and you need to make the best of it while you have your faculties about you. He and Denyse returned to the United States in 1973, and it wasn’t long before the diminutive Frenchman was setting the tracks of America alight again. The crowning moment came in 1976, when he teamed up with Billy Turner to ride the two-year-old colt Seattle Slew, who’d at $17,000 had been pretty much overlooked at the sales. “Slew” cruised to victory in the Champagne Stakes at Belmont Park, crowning an unbeaten season, and claiming the Juvenile champion’s title, as well as putting his hand up as a legitimate contender for the Triple Crown. To put this into perspective, the previous Triple Crown winner was Secretariat in 1971, and before him you’d have to go back to Citation in the 40s. The most recent Triple Crown winner was Affirmed in 1978, and no horse or rider since has been good enough to do it. Seattle Slew warmed up for the Kentucky Derby with facile victories in the Wood Memorial and Flamingo Stakes (both Group Ones) on his way to the Twin Spires at Churchill Downs. His running style was on the lead, and as he took his place in the stalls for the 103rd renewal of America’s most famous race, he was the only unbeaten aspirant for the Triple Crown in history, never headed for a single yard in any race before. He jumped awkwardly however, and for the first time, he missed the break: within a hundred yards there was just one horse behind him, and Cruguet knew he was in trouble. He shook the reigns for a moment, and surged through the field to be second before the horses entered the clubhouse turn, then proceeded to destroy his field in the closing 600 metres with a spectacular display of power galloping. It was the same story in the Preakness Stakes, and while Cruguet maintains to this day that Seattle Slew’s best trip was at a mile, his class carried him unchallenged to heroism in the Belmont Stakes, to complete the third leg. In a moment which still occupies the columns of journals more than 35 years down the road, attracting praise and derision in equal measure, with more than 30 yards to the finish line, Cruguet raised himself out of the saddle in triumph in the manner of a gladiator, extending his right arm over his head and saluting jubilantly to an equally jubilant mass numbering well over 150,000. It’s against the rules, we know, but this was a Triple Crown hero in the true sense of the word, and in any event, there was nothing in sight to alter the outcome. While Cruguet was equally effective on both American surfaces, he was without peer on the turf, and a year later he was on board Mac Diarmada, whose victories in the Washington DC International and the Canadian Turf Championship saw him voted Champion Turf horse. The journeyman announced his retirement at 41 in July 1980 to join his wife as a full-time trainer, but the lure of riding had him back in the saddle two years later. His last major Grade One Stakes victory came aboard Hodges Bay, again in the Canadian International at Woodbine. Today he lives in historic Midway just outside Lexington in the vicinity of one of the world’s great stallion stations, Winstar Farm, and the late Sheikh Maktoum al Maktoum’s Gainsborough Stud. It’s no coincidence that the Woodford Bourbon Distillery is in the vicinity. For many years after his retirement, he made guest appearances for organisations such as Old Friends, a retirement and rescue facility for pensioned thoroughbreds. He almost completely disappeared from the public eye when he became the caregiver to his wife Denyse, when bedridden from a stroke in 2003, until she passed on in 2010 at age 80. At 74 he remains active, working horses daily at the track, and he’s in excellent shape for a man who came off horses more often than he’d care to remember. He puts that down to a determination to make the number one box his home, and the fact that it often involves calculated risks which turned nasty. His pluck, his natural intuitions, his athleticism and dare we say, his upbringing, took him to the winner’s circle countless times, yet you know this is a man who remains comfortable in his own skin, “I crossed the line in front in more than 7000 races, but the truth is, I only won 500 them. Good horses did the rest”. A couple of hours with Cruguet is riveting, and he speaks easily of the legends that forged the golden years of the game, Penna, MauriceZilber, (for whom he rode the great Dahlia), Luro, Bill Mott, Woody Stevens and Charlie Whittingham. When you ask him to name the greatest horse of all time, and you toss in the names of Secretariat and Affirmed, he’s unhesitating: “There was none better than Slew. He could do a mile in 1 minute 31, and seven furlongs in 1 minute 20, and there’s no horse in history could go with that”. If it’s at all possible, Cruguet offers that Slew’s legacy at stud may even have eclipsed his feats at the races. The dominant sire-line of the current era comes courtesy of his son A.P. Indy, and we owe it to Slew and his masterful rider, that we have A.P. Arrow at Summerhill today. The TimesThey call it a craft, but the best exponents are real artists. Jockeyship is a job like no other. It’s thrilling, dangerous and unpredictable if you’re in the irons, and a marvel if you’re in the grandstand. The balance between winning and losing, hero and zero, elation and the agony of broken bones rests on a proverbial knife edge. Like a Zen calligrapher, a jockey must show assertiveness, intuitive timing and boundless bravery. This arcane artistry will be on display tonight at Turffontein as battle is commenced in the annual International Jockeys’ Challenge. South African maestro Anton Marcus leads the six-man team of locals against an outfit skippered by new British champ Richard Hughes. Of course, riding excellence is no novelty to us in this country. From Cocky Feldman to Michael Roberts to Basil Marcus to Dougie Whyte, we’ve produced generations of little big men more than capable of holding their own on the world racing stage. It must be something in the water - or the lettuce. Though we watch good riding day-in-day-out, it’s still exciting to see the home-grown talent pit itself against worthy opposition from abroad. The image of jockeys has been tarnished recently. Aussie ace Damien Oliver is in hot water Down Under for illegal betting, while European superstar Frankie Dettori had a positive drug test in France and faces a lengthy ban. Both these guys have ridden in the International Jockeys’ Challenge in previous years, so a bit of a shadow is cast across the event, not to mention the profession. Most racegoers will also be disappointed that the South Africans will not be awarded Protea colours for their participation, as earlier teams were. Racing’s suits appear to have got themselves into an unholy admin mix-up with Sascoc, the paper-shuffling body that authorises national colours. This has, in turn, sparked an unseemly public row within the industry. The upshot is that the South African team will race in their horses’ owners’ silks while, weirdly, the visitors will be decked out in their national colours. Racing aficionados will hope that the real action tonight, and at the second Challenge leg on Sunday at Clairwood, will blow away all this blight and remind us of the game’s glories. Each leg has four races, all handicaps. Jockeys and teams get 30 points for a win, 15 for a second place, 12 for third, and so on, down to one for 12th. Horses in each race were seeded and mounts chosen by ballot. Marcus’s team-mates are Jeff Lloyd, who flies in from his new base in Australia; Gavin Lerena; Piere Strydom; Anthony Delpech, and Muzi Yeni. The internationals are Hughes, who sensationally rode seven winners in a day as he closed on the British Championship last month; Jimmy Fortune; Tom Queally; Seamie Heffernan; Paul Mulrennan, and Joao Moreira. Heard the one about the six South Africans, five Irishmen and a Brazilian? If you’re an outsider looking in, you’d be forgiven for thinking the Ready To Run gallops are about horses. And for the most part, you’d be right. But that would be ignoring the role our people play. There’s not a soul on Summerhill that doesn’t have a hand in it, and on the day, they’re all on deck; there’s no sale in the world that demands more, particularly when you’re hosting it on your farm. In the end though, it’s about the horses and the way they perform, and the performance is a product not only of the horses’ talent, but of the skills of the little man on top. That’s why we started a new tradition last year, honouring the best rider of the day. Unsurprisingly, the accolade went the way of our senior educator in 2011, John Motaung, who’d enjoyed two scholarships to the United States prior to his “championship”. We asked a man whom Graeme Hawkins described at Thursday evening’s gala dinner as the most gifted and thoroughly knowledgeable horseman he knew, to be our judge. Garth Puller, genius that he is, needs no introduction. He’s exactly what Graeme Hawkins said he is. 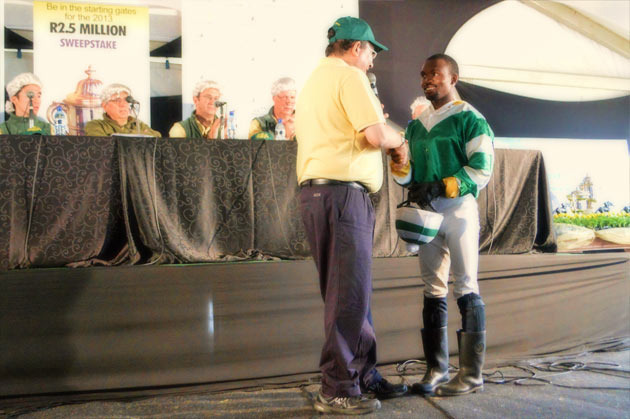 And this year, he chose Mthokozisi “Small Boy” Sithole as his Rider of the Gallops, for his style, his finesse and his “oneness” with his mount. No small compliment, coming from whence it did. Well done Small - you’re a big boy, today. When Godolphin’s star jockey, Frankie Dettori took the ride on the opposition Coolmore’sCamelot in the Prix de l’Arc de Triomphe (Gr.1) a fortnight back, we thought we’d struck a new angle in predicting a rift between jockey and employer was unavoidable, and that the winds were “certainly a changin”. Yet someone out there even accused us of “sour grapes”, though what that had to do with the battle between Coolmore and Godolphin, we don’t know. The truth is, you didn’t have to be a genius to know that this was something of a thumb on the nose from Dettorri to his erstwhile employers, and whatever the reasons, that’s how life is. Either way, nobody has a monopoly on anybody else’s money or services, and it seems we were on the money in suggesting that Frankie might be on his way. Just yesterday, the website of Sheikh Mohammed’s Godolphin operation read “Frankie Dettorri will not be retained by Godolphin next year”. Dettori, whose 18-year spell in the royal blue began with the ride on the operation’s first Classic winner, Ballanchine in 1994, has registered 110 pattern race successes for the firm in total. According to Godolphin’s racing manager, Simon Crisford, “Frankie has made the difference between winning and losing on so many occasions in the world’s biggest races. However he is looking for a fresh challenge, and we felt that the retainer was not really working, so this is the best way forward.” If riding for the enemy in the Arc was not what was meant by “the retainer is not really working”, it’s anybody’s guess what it might mean. And while Dettori may not always be counted upon to be the arch diplomat, he certainly played this one like he was blessed by the Vatican, “I’ve had 18 wonderful years. Godolphin has been a major part of what I’ve achieved in racing, and I’ve loved every minute of it. I feel the time has come for a change. My position in the stable has changed a little bit, and I need a new challenge. Sheikh Mohammed had the confidence to take me on board when I was young, and we smashed every record together”. One thing you can count on: we haven’t seen the last of Senor Dettori. The announcement this week that Frankie Dettori would be taking the mount on Camelot in Sunday’s renewal of Europe’s greatest horse race, the Prix de l’Arc de Triomphe (Gr.1), was pretty matter-of-fact. Yet there is a strong underlying political message in it. You see, Frankie Dettori is one of the world’s top jockeys of all time, and for well over a decade, he has been the unrivalled favourite of his employer, His Highness Sheikh Mohammed bin Rashid Al Maktoum, Ruler of Dubai. His annual retainer was rumoured to be in the millions of dollars, and besides being rewarded for every ride and the commissions that accrue to jockeys on their prize money, he was showered with lavish presents for big race victories. Some seven or eight years ago, Sheikh Mohammed’sGodolphin racing operation was pretty much at the summit of the sport’s most successful racing operations. Ironically, the Sheikh chose that time to declare war on their principal adversaries, Coolmore. Nobody really knows the reasons behind it, but it was suspected that the Sheikh felt the commercial traffic between the two operations was “one-way”. He was providing liberal patronage for the Coolmore stallions, and was spending vast sums on their progeny at sales venues around the world. Coolmore were seldom if ever seen to put their hands up in the auction ring for a Darley (Sheikh Mohammed’s breeding arm) sired yearling, and they never sent a mare to any of the Sheikh’s own stallions. Besides, Sheikh Mohammed had established a global showpiece in Dubai’s World Cup meeting at the end of March, boasting the world’s richest prize money, and there was scarcely a Coolmore horse in sight. It has to be said though, that at the time Coolmore presided over the most formidable band of stallion material in Europe (if not the world), and that really was the reason behind the Sheikh’s regular dominance of the market for youngsters sired by these stallions. In simple terms, he wanted to be the best, and so he had to buy the best. At the same time, Coolmore were also his principal opposition at the races, and they too wanted to own the best, so that they not only competed with the Sheikh in the sales ring, (which meant that quite often they were pushing him to pay substantially more for stock in which they may sometimes have owned an interest as well), but they had the luxury (and indeed, satisfaction) of being able to sell him services in numbers to their stallions. They had obviously taken a commercial decision as far as the patronage of the Sheikh’s stallions was concerned, and felt they could do better by continuing to use their own, a point borne out by results at the races. And when it came to the World Cup, Coolmore considered the timing inopportune: by March, their horses were in need of rest after demanding European campaigns. For obvious reasons, lean times followed for the Godolphin operation in the wake of the declaration of war, and Coolmore have pretty much had the European racing scene to themselves since then, with the progeny of Sadler’s Wells, Galileo, Montjeu, Danehill, Giant’s Causeway and Danehill Dancer, and the associated Maktoum entities have pretty much been feeding on the left-overs. In the midst of all this, Frankie Dettori remained staunchly “Sheikh Mohammed”, and those who follow the game closely will recall many an embrace, particularly in their heyday, between jockey and master following a big race victory. In more recent times though, there have been rumblings within the Godolphin camp about Frankie’s position as the “chosen one”, and that of the new pretender to his throne, Mickael Barzalona, who has had the pick of the rides in recent seasons. That there is a rift developing, whatever they may say, is unavoidable, and in his appointment to ride Camelot, arguably the best middle distance three-year-old Europe has seen in some years, (perhaps decades), there are two messages. Coolmore have laid down a challenge by employing Sheikh Mohammed’s darlin’ and the winds are certainly a changin’. Don’t worry, we know the feeling. When Smanjemanje went down a nose in the Vodacom Durban July two weeks ago, it was the second time we’d been denied by a slim margin in the big race. Angus suffered the same fate at the hands of Ipi Tombe in the 2003 renewal, and if those decisions had gone our way, we’d now be sitting on six July wins, one ahead of the legendary Birch Brothers, who dominated the Breeder’s Premiership for more than half of the last century. They actually have six July winners to their credit, but they’ve won five Julys, the explanation being the dead-heat between Sea Cottage and Jollify in 1967. The Jockey’s Championship this year is going to the wire just as narrowly, with Anton Marcus heading the log on 182 victories and Anthony Delpech breathing down his neck on 177. There are twelve days left in the season, and this one can go either way now. Delpech got a “holiday” of a few days recently for a riding infringement, and he took time out to visit Hartford House with his family. There was an air of despair about him, as he felt he’d blown his chances with the suspension, but it’s a measure of the man that he’s back in the hunt. He did his prospects a turn yesterday when he picked up the chance ride on Great Smokey, a Summerhill-bred who was totting up a double at the Vaal with an end-to-end performance under a masterful judgment of pace. Of course, we’re in our own battle for our eighth Breeder’s Championship at the moment, having surrendered the lead to Klawervlei during June, when they pulled more than R400,000 ahead at one stage. We’ve clawed our way back, and we’re now sitting with a lead of just on a million. You might take comfort in such a cushion, but it remains possible for us to be overhauled, and we won’t be making any claims until the “big lady” has had her say on July 31st. If we do pull this one off, it’ll be one of the more satisfying. By our own standards, we haven’t had a great year, despite the fact that we’re in front in terms of Stakes winners, but it says something for the toughness and durability of our stock that they’ve run more often and earned more on average than our pursuers, who now have an advantage in terms of numbers at the track. Either way, we’re prepared for any eventuality. Nobody owns a monopoly on a championship. The Summerhill team long ago identified other markers by which it wants to be measure. They know the equations others don’t seem to know. Great harvests come from arid sources. Seven Breeder’s Premierships, the winners of four Durban Julys, three J&B Mets, three Summer Cups. They all sprung from nowhere. The other thing that drives them, is knowing that one day you’re going to be beaten; it’s the best way to avoid the trap of thinking you have something to lose: you are already naked. There is no reason not to follow your heart. The number of stories about England’s most famous jockey are legion, and we just stumbled across another one. In his twilight days, Ireland’s greatest trainer, Vincent O’Brien stumbled across one last champion, Royal Academy. Such was the colt’s talent, he delayed the master’s retirement by two years. It was in the early days of the Breeders Cup, and Vincent, always the adventurer, decided to take his Group One winning sprinter for a final tilt at the Breeder’s Cup Mile. By this time, the veteran was already approaching his 80’s, and he elected to take the “long fellow” to the States with him. Remember, Lester Piggott had already retired once, and had been brought out of retirement by Vincent O’Brien. Perhaps not quite with this purpose in mind, but almost so. That Royal Academy turned this into one of Vincent O’Brien’s best-remembered adventures, is now part of Ireland’s folklore, but there was an amusing aside as well. As Lester Piggott disembarked from his flight into Chicago, he was asked by the immigration officer if he was there for business or pleasure. The laconic Lester replied, “just pleasure”. And thus ended the story, as Messrs Justenni and Brooks so famously said “True pleasure is rare”! The most sought-after Jockey’s title in the world, is the crown in Hong Kong, which has been in South African hands for eighteen of the last nineteen years. Only one man has ever won it on ten consecutive occasions, and he is Durban-born, Cape Town-trained and Hong Kong-celebrated Dougie Whyte, otherwise known in Far East realms as “The Demon”. This is no single-dimensional horse rider though, he’s a man with a mind, great athletic attributes, the determination that goes with champions, and, in a little known cameo to his career, he was once South Africa’s leading Young Winemaker with his Demonvale range. Dougie’s also a man who doesn’t deal in trifles, and if he’s coming to South Africa to take a mount in a race, it’s going to be for the Vodacom Durban July, and it’s going to be a serious horse. He’s aboard the Summerhill wonder, Pierre Jourdan, the pride of the Gary Alexander Racing stable and a little owner, Emilio Baisero, who reminds us all that in racing, you don’t have to be the biggest businessman in the world to own the best horse. Pierre Jourdan has had a perfect preparation, culminating in a gallant second under 60kgs in the Jubilee Handicap (Gr2), and according to Dean Alexander, he’s ready to go, though nobody really knows how far he’ll travel. Spare a thought for young Derreck David, his regular pilot and now on standby, though it seems that issue is taken care of, too. He has great respect for Dougie Whyte, who’s in touch with the stable several times a day, instructing Derreck as to what he wants him to do with “PJ” in work, and sharing insights on the video material he’s watched, not only of PJ’s previous efforts, but of the opposition. There won’t be a stone unturned, come Saturday afternoon, and all the connections have to worry about now is Dougie’s plane arriving on time. If all else fails, Derreck will be there to fill the breach. 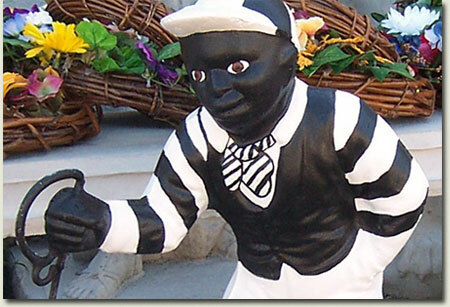 The trademark on most Kentucky farms is a statue of a black jockey in the owner’s racing silks, with his right hand outstretched and something resembling a rectangular steel ring dangling from his hand. It’s always been a matter of intrigue as to why there is such a ‘stock’ sameness to so many properties, and we just found out. On a freezing evening at the height of the American War of Independence (December 1776), General George Washington (he of the “never-told-a-lie” story) and his troops pulled up on the banks of the Delaware River at nightfall, with the intention of launching an attack on the British army on the opposite side, during the course of darkness. A 12 year old African-American jockey by name Jocko Graves, approached the general, and asked if he could join his regular force. Imagine though, the size of this fellow, a jockey of twelve, and you’ll understand the general’s hesitation. As a consolation, he offered the young man the job of caring for the calvary’s horses on the banks of the river, while the battle was in progress. He instructed him to hold out a lantern, so that when the troops returned, they would know where to find their horses. With the battle successfully resolved, the general and his men duly returned, to find the lantern still burning, but the young jockey frozen statuesquely to death. The General was so moved by the young man’s dedication, he commissioned the erection of a statue dedicated to the “Faithful Groomsman” on his Mount Vernon estate. By the time of the Civil War some decades later, lawn jockeys played a pivotal role in pointing out the safe houses of the Underground Railway to runaway slaves, a green ribbon clasped in the hand indicating safety, and a red one pointing to danger. South Africa’s best jockeys will go head to head with some of the top riders in the world in Leg 1 of The Citizen International Jockeys Challenge at Turffontein Racecourse in Joburg this Friday night. The six riders in each team will clash in four Challenge races - Races 3, 4 7 and 8 - and will accumulate points according to the finishing positions of their mounts. To equalise the chances of the two teams, the runners in all Challenge races were seeded beforehand by a panel of racing experts and there was then a draw for mounts. The overseas team drew for horses seeded 1, 3, 5, 7, 9 and 11 in the first of the Challenge races and for seeds 2, 4, 6, 8, 10 and 12 in the second and so on. The second leg of the competition takes place at Kenilworth on Sunday and the winning team and leading individual rider will be decided by the total points scored across the two legs. Christophe SoumillonBelgium-born CHRISTOPHE SOUMILLON (29), champion jockey in France in 2003, formed part of the international team in South Africa in the 2008 International Jockeys Challenge in which he booted in two seconds for his team. On the same day he won the Dingaans on Oracy and finished second on Smart Banker in the Summer Cup. Comes to South Africa fresh off a win on Buena Vista in the Group 1 Tenno Sho (Autumn) in Tokyo, one of seven G1 wins this year. In 2010 he has won G1 races in Japan, Canada, England, France, Dubai (he won the UAE Derby for trainer Mike de Kock on Musir) and Hong Kong. He also won a G1 hurdles race in France. Kieran FallonKIEREN FALLON (45), six-time champion jockey in the UK, has won nearly every top feature race in his native Ireland and Great Britain, including the Investec Derby three times, the 1000 and 2000 Guineas four times each and the King George VI. He has been associated with some of the top racehorses of recent times, including Dylan Thomas who won the Champion Stakes before taking the Arc de Triomphe in 2007. Having spent 18 months suspended after testing positive for a banned substance, he returned to race-riding in September last year and has won three G1 races since. They included riding Gitano Hernando to victory in the Goodwood Stakes at Santa Anita in October last year. Martin GarciaBest known for his association with Preakness Stakes and Haskell Invitational winner Lookin At Lucky this year, MARTIN GARCIA (26) is one of the most promising young riders in Southern California. After arriving in the USA from Mexico in 2003, he was spotted working in a deli near Pleasanton Racetrack by a patron who asked him if he had considered becoming a jockey. His first win came aboard Wild Daydreamer at the Bay Meadows Fair in August 2005 and early the following year he beat brilliant Russell Baze for leading jockey honours at Golden Gate Fields before they tied for the title at Bay Meadows. Garcia won the Preakness this year in only his second ride in the USA Triple Crown. Halis KaratasHALIS KARATAS, nicknamed “The Wizard”, has been champion jockey in his native Turkey since 2002. He has won over 3,000 races during his 25-year career including three Gazi Derbys (Turkey’s premier race) and six Prime Ministry Cups. His international riding experience includes the 2009 International Jockeys Challenge when he boosted his team’s points tally with a third. He was also second to Mick Kinane in the internationals versus young riders’ event. Was one of the European riders at the Shergar Cup in 2008 and won the 2005 Cape Verdi in Dubai aboard Ribella. He has ridden 241 winners on both thoroughbred and Arabian horses in Turkey this year for a 30% strike rate and has accumulated nine G1 victories. Umberto RispoliItalian UMBERTO RISPOLI (22), who rode in his first race on 5 February 2005, notched his first win after just 14 days and four years later smashed Gianfranco Dettori’s long-standing record of 229 winners in a season, winning 245 races to take the champion jockeys’ title in his home country. His record-breaking mount was Sugarland at Pisa on 21 November. He worked in Britain for Marco Botti in 2007-08, has a victory in Germany to his credit and has ridden in Mauritius. He scored his first win at the highest level last month, when winning the Premio Lydia Tesio in Rome aboard Aoife Alainn. Born in Naples, he has more than 900 victories to his name and his career highlights include a five-timer at Livorno in 2009. Anton MarcusSouth Africa’s ruling champion jockey ANTON MARCUS (40) captained the Proteas to victory in last year’s International Jockeys’ Challenge. He accomplished an immensely high 30% strike rate in taking last season’s Jockeys’ Championship. It was his second title following a win in 2000-01. Big-name horses he has partnered this year include Warm White Night (Cape Flying Championship), Bravura (Investec Cape Derby), Mother Russia (Empress Club Stakes and TBA Paddock Stakes) and Smart Banker (Horse Chestnut Stakes). Marcus has ridden with distinction in Dubai, Hong Kong, Mauritius and Singapore and led the Rest of the World team at the 2010 Shergar Cup at Ascot. Anthony DelpechWith three big-race wins on Vodacom Durban July day this year, including partnering Bold Silvano to victory over stablemate Irish Flame in the big race, Seychelles-born ANTHONY DELPECH (31) is a name few will forget in a hurry. Last Saturday he won the Charity Mile aboard Alderry. He finished third behind Anton Marcus and Felix Coetzee on the national jockeys’ log last season, when his 133 winners included Gluwein (Majorca Stakes) and Here To Win (SA Fillies Classic and Garden Province Stakes). He has ridden with great success in Mauritius, Hong Kong, Singapore and Dubai and this will be the third time running he has ridden in the International Jockeys Challenge. Andrew Fortune2008-09 South African champion jockey ANDREW FORTUNE makes his International Jockeys Challenge debut - he was team manager last year. Out of the saddle for much of last season, he moved to the Highveld in August to ride for trainers Gary Alexander and Alec Laird, vowing to regain his title. He is currently in good form, having ridden 47 winners so far to be second on the national jockeys’ log. 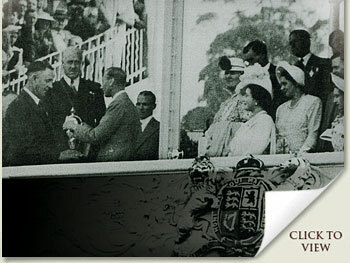 Those successes have been achieved at every racing centre in the country barring Port Elizabeth. A heavy-weight jockey, he has still won several graded races, including the Peninsular Handicap (Ivory Trail), Diadem Stakes (Blue Tiger), Odessa Stud (Mother Russia) and Tibouchina Stakes (Ethereal Lady). Gavin LerenaGAVIN LERENA (24), who set a record for the number of wins during an apprenticeship (283), has ridden successfully in South Africa, Zimbabwe and Mauritius. He won the Bronze Saddle at last year’s International Jockeys Challenge after coming into the team at the last minute to replace Kevin Shea. He won two of the Challenge races and finished third in another. He comes into the team as a substitute again this year. Lerena has ridden 545 winners in his career, including the SA Classic and SA Derby on Kings Gambit, and other graded stakes wins include this year’s SA Oaks (Arcola) and Gauteng Fillies Guineas (Fisani). He showed last year that he is not overawed by a big occasion. Muzi YeniWell-liked Durban-born jockey MUZI YENI (24), who won his first race (Storm King) in November 2003 and came within two winners of his century last season (his best yet), scored the biggest win of his career on Sweetie Pie in the 2010 Gold Circle Oaks at Clairwood in July. He will be partnering Sweetie Pie again in the Victory Moon Stakes, to be run at Turffontein on the same night as the International Jockeys Challenge. He is a favourite of champion trainer Mike de Kock, who is quoted as saying: “Muzi has a good work ethic and is in the team on merit.” He was chosen to ride in an international jockeys’ invitational in Korea and rode a winner there earlier this year, his only international experience. Andrew Fortune has conquered many things in his life, not the least of which a life-long battle with harmful substances. His is a real story of triumph over adversity, not only in terms of substance abuse, but against the odds of life. Andrew knows poverty, he knows struggle, and he knows about living on the margins, so his story as a jockey is something of a fairytale. As talented a rider as this country (nay the world) has known, he came from nowhere the season before last to claim the jockey’s title, and moved us all with the most emotional acceptance speech we’ve known. It wasn’t talent alone that took him there. It was the dedication of a real professional. That he took time out with the Alexander boys to throw his leg over a selection of Ready To Run candidates, tells us he is not abandoned the common touch. An hour with Andrew is like a semester at college, and besides, it’s good for the soul. Looking at the list of horses he rode, it was gratifying to hear he liked more than he didn’t, and he eulogised over more than a few. The headline-grabber was the British Open at the “Royal and Ancient”, where virtually unknown (other than to his countrymen) South African, Louis Oosthuizen, surged to one of the biggest margin victories in the history of golf’s biggest tournament. Louis’ unerring driving and his cold-blooded nerve on the putting greens, were hallmarks of one of St Andrews’ greatest golfing exhibitions. In the process, Louis Oosthuizen joined the South African colossi, Bobby Locke, Gary Player and Ernie Els as previous winners of the Open, which comes hard on the heels of this country’s staging of one of the most successful Fifa World Cups in history. But if you’re a racing man, you would’ve been equally delighted at the news that Dougie Whyte has taken his tenth consecutive Hong Kong Jockeys’ title at the expense of arch-rival, Australian Brett Prebble. This makes it 18 of the last 19 titles in that part of the world falling to South African riders, surely a record without precedent anywhere, let alone in one of the most popular and competitive racing jurisdictions in the world. Take a bow the South African Jockeys’ Academy. “The Demon”, as Dougie is nicknamed in that former British Colony, was sixteen winners adrift of the runner-up just over a month ago, and he was still lagging by nine entering the last fortnight. Those of us who go back that far will remember Doug’s imperious ride on London News in the 1997 version of the Queen Elizabeth II Cup. The added significance of that great warrior’s victory lay not only in the fact that, as a five-time Group One winner, he had to concede weight to the whole field, and that he came from the outside draw in record time, but it also marked the first international performance of a South African horse in the post-isolation period. This was the first hint, despite our isolation, that South African breeders had not lost quite the ground our sportsmen from other codes had done.